With the narrowest diameter of any 6×36 stainless steel wire rope on our site, this 6mm 6×36 stainless steel wire rope example is available with either a wire or fibre core. This gives you even more choice, with each core type dictating the load capacity and breaking force. 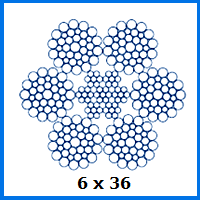 The fibre core edition of this 6mm 6×36 stainless steel wire rope has a 1.9 tonne working load limit, compared with the 2.05 tonne capacity of its wire core counterpart. The upside of this slightly less sturdy rope is that it is lighter and more flexible, which may be an important perk in certain cases. Another point to take into account is that stainless steel will not rust in the same way as other, untreated metals. This makes it suitable for safe maritime use in a number of contexts, as well as in waterworks and other facilities where moisture is invariably present. With so many different options for stainless steel wire rope available here at Rope Services Direct, you might not know which product to pick. We have compacted 8×25 rope that is stronger and easier to work with, creating fewer abrasions and resisting fatigue. We also stock non-rotating rope that will boost safety further. Browse our full range and you will even encounter specialist crane rope, assemblies and fittings of all kinds. Let us help you overcome any wire rope obstacles by calling 01384 78004 or filling out our query form today for a quote, product info or advice. 6mm 6x36 Stainless Steel Wire Rope Overall rating: 5 out of 5 based on 6 reviews.